Class Survey Summaries | Go to Sleep. Study. Mathinate. Go to Sleep. Study. Mathinate. Inspired by Kathryn’s and Sarah’s posts on learning about their students, I gave my students the surveys this past week (the first week of school). I followed Kathryn’s suggestions for the order – learning style on Tuesday, true colors on Wednesday, multiple intelligences on Thursday. Then, they compiled their data on Friday with the “Me at a Glance” sheet. I had them turn that sheet in to me and then I used Excel to summarize each of my classes. 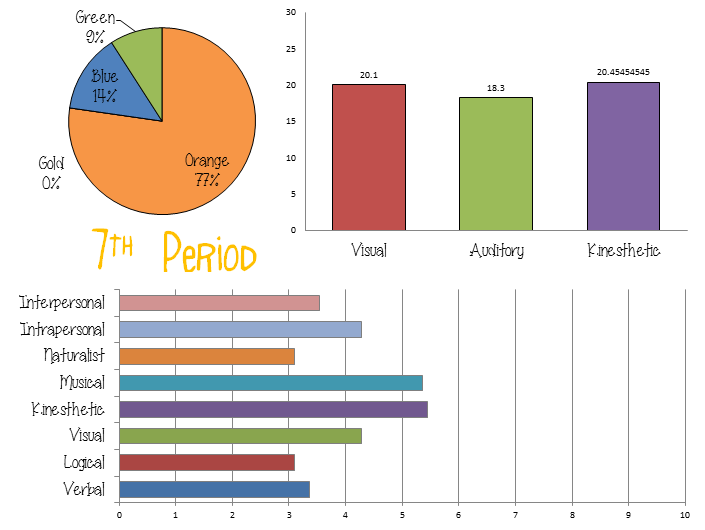 There’s definitely a trend among my classes for being an orange personality and kinesthetic learner. I think I’m gold and visual myself. But of course, the goal is to use this data to tweak my lessons to suit each class. On Friday, we did a word sort and note-taking that involved walking to different stations around the room. I created this Excel file to organize all of the data for each class and then to create the graphs. I then copied the graphs into Word and edited the fonts and sizes. I think there’s still a few missing “Me at a Glance” sheets that weren’t turned into me, so I’ll check on Monday to see if anyone has one to turn in. Once I have everyone’s data, then I’ll print out all of the classes’ summary graphs so that I can post them in the classroom.